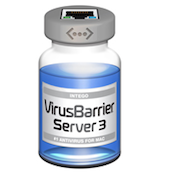 Intego has announced VirusBarrier Server 3, an updated defense in the never-ending battle against viruses and malware. This latest offering from Intego comes a few months after the release of its VirusBarrier X6. The server edition of the software is based on the same set of threat-detection protocols. A Mac running as a server gets comprehensive protection against all varieties of Mac OS, Windows, and Linux malware. The software now runs on 64-bit code. Other new features include: remote access, giving administrators the ability to modify settings from afar; a two-way firewall (which keeps sensitive information from getting off the server); better detection of scareware and spyware; e-mail server protection; and performance control, which lets you choose how much processing power you want to devote to scans at any given time. VirusBarrier Server 3 requires Mac OS X 10.5 or later, or Mac OS X Server 10.5 or later. Of course, the Mac will need to be configured to run as a server. Pricing for VirusBarrier Server 3 starts at $200, but the exact price will depend on your configuration and needs, according to Intego.